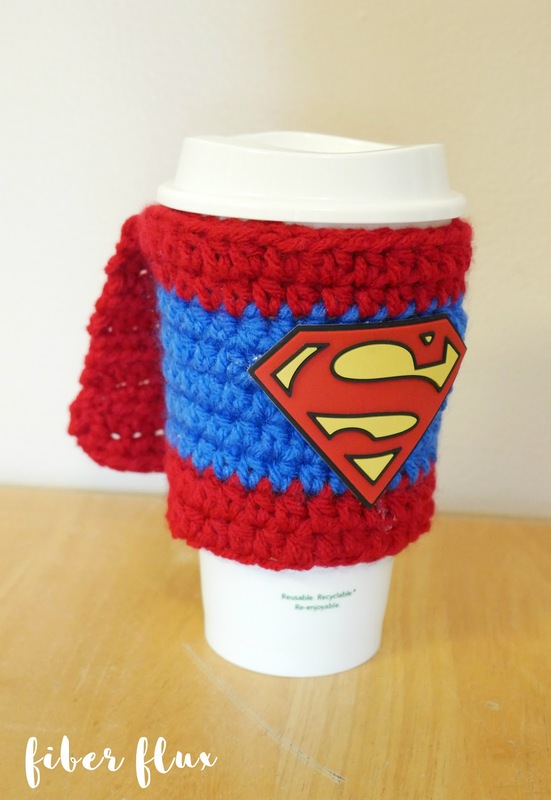 Know a super somebody? 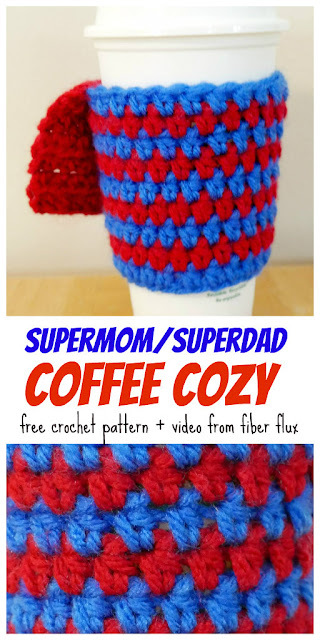 Crochet this cute Supermom/Superday coffee cozy as a quick gift. 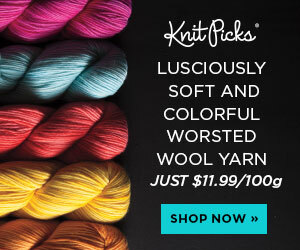 It doesn't take much yarn at all and is perfect for gifting with their favorite coffee/tea and perhaps a little gift card too! Need a little help? There's a full video tutorial below! 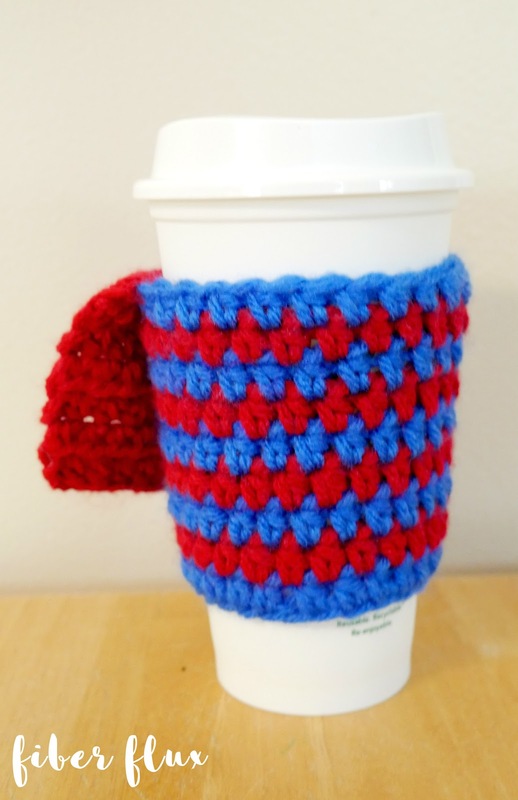 I made this cup cozy to fit a 16 oz coffee cup (grande). If you need to modify the circumference, you can work more or less starting chains to begin. To modify the height, work more or less rounds. 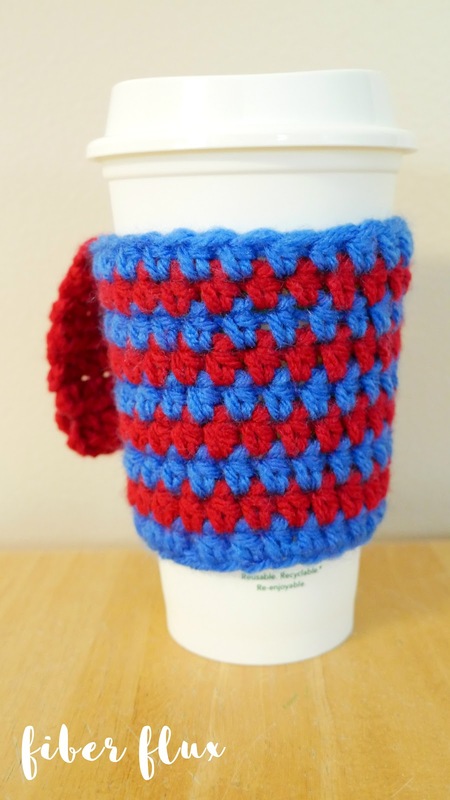 Note: I made two cozies, one was worked by working just one color before switching colors for a striping effect. For the other cozy I worked two rounds of red, 5 rounds of blue, then two more rounds of red. I then attached the patch to the center of the wide blue stripe. Feel free to make yours exactly how you like! Ch 28, join with a sl st in the furthest ch from the hook. Round 2: ch 2, then work a hdc in each ch. Join with a sl st to close round. Repeat row 2 for a total of 9 rounds or desired height. To continue onto the cape, do not fasten off the yarn and continue below. Ch 2, then work a hdc in each of the next 10 sts. Row 1: ch 2 and turn, then work a hdc in each st across. 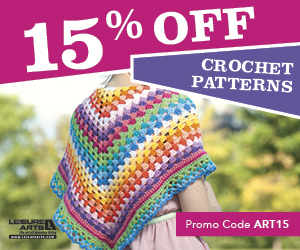 Repeat row 2 until cape is desired length. I made the cozy with the patch have a cape the same length as the height of the cozy. For the striped cozy, I made mine roughly half the size. Weave in any ends that remain and if you'd like to add a patch, do so by hot gluing it or sewing it on. Do NOT iron it on! 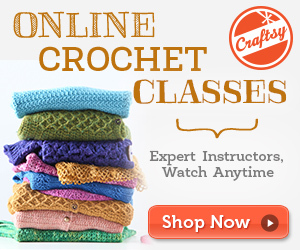 If you used acrylic yarn , it will most definitely melt your project!